Which Fruits, Vegetables, Grains, Nuts and Seeds Should I eat on my fertility plan? This is the advice we give to all our fertility clients. As it happens, the healthiest pregnancy diet is not different from a natural fertility diet. When trying to conceive, pay attention to getting more whole foods into your daily diet. Creating a healthy baby demands the same conditions as conception, pregnancy, delivery and breastfeeding. Men and women both follow the same fertility diet principles. Food and fertility are intimately linked. A diet that is 80% raw food, along with some healthy organic meat and dairy choices works best. Nutritional deficiencies can cause menstrual irregularities in women, and lower sperm count in men. 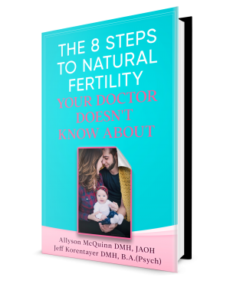 The fertility of both men and women depends on the bioavailability of essential nutrients, such as zinc, magnesium, vitamin C, E, and folic acid. What are the best plant-based foods to help with your natural fertility? Dark leafy greens like spinach, romaine, arugula, and broccoli are high in folate, and B vitamins. Studies have shown they improve ovulation and sperm count. Men who get higher doses of folate make healthier sperm, potentially reducing the chances of miscarriage or genetic problems in the baby. Pumpkin Seeds are high in non-heme iron, the type of iron found in certain plant food and iron-fortified foods. One study found that women who regularly took an iron supplement (which is non-heme iron) were 40 percent less likely to have trouble getting pregnant than those who didn’t take iron. Toast pumpkin seeds in the oven for a crunchy (and fertility-boosting) snack. Whole grains prepared in the traditional ways – methods of pre-soaking and sprouting grains activate all the healthy benefits of grains, while minimizing their negative effects. Beans! That magical food. Researchers at the Harvard School of Public Health looked at nearly 19,000 female nurses who were actively trying to get pregnant and found that infertility was 39 percent more likely in women with the highest intake of animal protein. But women who ate a lot of plant protein were substantially less likely to have trouble trying to conceive. So throw garbanzo beans into a salad, or make a vegetarian chili. Don’t like beans? Lentils, tofu, natto, tempeh, miso and nuts are good plant-based proteins as well. Acai, Goji, raspberries, strawberries, and blueberries are fertility superfoods. Compared to other fruit, they are low-glycemic, anti-inflammatory, and of benefit to every step of getting pregnant. They promote timely ovulation and healthy eggs, and the lining of the uterus healthy and strong. They are high in vitamin C and magnesium, beneficial for male fertility and testosterone production. Nuts (and seeds) are some of the most nutrient dense and delicious foods on earth. They are an important part of fertility nutrition because they supply the body with ample fiber, protein, minerals and essential fatty acids. Proteins are required for building and repair of the body’s tissues. This includes a growing baby in its mother’s womb. The amino acids that make up protein are the building blocks of the body’s cells, including those of your baby. Protein is also an excellent source of energy. Almonds, and walnuts are two of the highest sources of protein from nuts.